So I was lucky enough to attend the FAZE SUPER GIRL EVENT a couple weeks ago, as a media guest. I wasn't sure what to expect when attending this event. I thought that it was going to be an intimate gathering (I swear I read some where that there would only be 33 people in attendance), so you can imagine my surprise when I came up to the Opera House to find a line winding around the building. But I didn't have to suffer the wait and cold alone, I had the awesome Tiffany to keep me company while we waited to be let in. It was great chatting with a fellow blogger about books and the blogging community. Once we were let in, after a bit of a wait, I got to see the interior architecture of the Opera House, and it's incredible! I can't believe I've lived in Toronto all my life and have never been to this building, I've also never been to the ROM (but that's a story for another day). After checking our coats, we decided it was time for a FREE MAKEOVER!!! 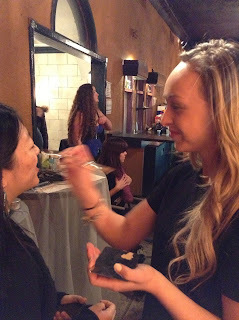 And the make-up artist was super sweet and managed to make my skin look like porcelain. I would've gotten my nails done to, but the line-up was insane! After our make-overs, we enjoyed some free pizza while we waited for the entertainment to begin! Fabulous book bloggers posing for their photo opt! Warning!!!!!!!! This clip contains squeeling girls and bloggers, lip-syncing stage crew and an up and coming heart throb, you may be converted into a Little b! You've been warned! And three times a charm! After Brendn finished his performance, a video was played that was meant to convey a message of empowerment, unfortunately there was a problem with the sound, so I'm not sure that message was completely conveyed. After apologies were made for the technical difficulties, the authors from the Breathless Reads tour were announced that they would be signing by the bar. 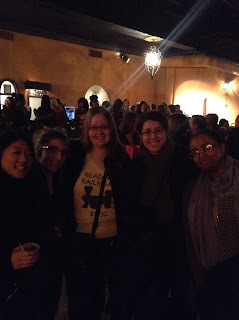 Authors in attendance included: Beth Revis, Jessica Spotwood, and Morgan Rhodes. Unfortunately Andrea Cremer had to pull out at the last minute (to many of our dismay) but Adrienne Kress was kind enough to donate her time. Of course all of us Book lovers and bloggers were excited to hear this (we were wondering when the signing was actually going to take place). They had a booth by the signing tables, where you could buy copies to have signed and it just so happens that I didn't have a copy of Shades of Earth yet, so I got Beth Revis to sign that for me (she was so nice). I did take pictures of the signing but unfortunately they didn't show up too well, but it was nice to meet and greet such talented writers! Unfortunately, I had to leave early and was only able to stay in time for the signing, but there are other amazing bloggers who have re-capped they're own experience of this Event (see linky list below). 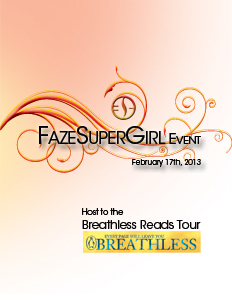 Overall, the Faze Super Girl Event wasn't the Breathless Reads book signing event I expected it to be (it would have been nice if the signing could have been held in a better lit and quieter venue), however, I did have a good time. It's always nice seeing fellow book bloggers and meeting great authors! This was an event marketed for girls ages 13-24 years old, and I think those who attended the event did have a great time, as you can see from the videos above. I only hope that these girls did leave feeling a bit more empowered, I know I left a little B! Thanks so much to Penguin, Faze magazine, and all the performers and authors who donated their time for this event. It was definitely fun to see everyone again, and to meet the authors for the time we had with them. Yeah, I left with a smile, and some swag! Haha, I think they have some kinks to workout for next time, but that's always the case when it's a first, right?